So you’ve joined one or two of the Top Daily Fantasy Basketball Sites out there: FanDuel and DraftKings (our partner sites). You’ve played a few games and keep seeing some of the same names beating you in games or big tournaments. Depending on whether you are playing in a Cash Game or a Tournament, there are different strategies on how to build your fantasy basketball lineup that will give you a better shot at winning. What is the difference between Cash Games and Tournaments? Both cash games and tournaments differ because of the payout structure so your lineup building strategy should also differ depending on which fantasy basketball game type you are playing. To win at DraftKings or FanDuel you need to examine the different daily fantasy basketball strategies to use in either cash games or GPPs. As mentioned above, cash games are typically 50/50’s, double up or head-to-head leagues. Playing in a 50/50 contest or double up means you only have to beat half of the field of fantasy basketball players to double your money. In a field or 20, or 50, or a 100 at FanDuel, you need to finish in the top half of the field to cash in. Same goes for head-to-head leagues, you’re only playing one other person, you just need to have a lineup better than your opponent does. All these cash game types means that 50% of the field wins. 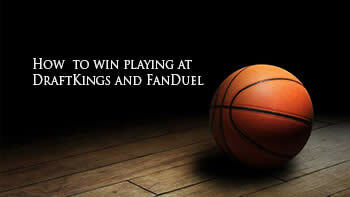 Because cash games are better odds to win (50%), you want to create a fantasy basketball lineup with a very high floor. In other words, you want to build a lineup that is well balanced and has NBA basketball players that consistently give you the same fantasy points each night. Cash games are not the contests to dig for deep sleeper picks at the bottom of the FanDuel salary cap list. Remember – To win money you only have to beat 50% of the field! When we mention “floor”, we are talking about on average what a fantasy basketball player will score in points on a given night. Although players can have good and bad nights, usually you can reasonably expect an average “floor” of points that you can count on for your fantasy basketball lineup. NBA Fantasy Basketball is a sport where players have very high floors for fantasy points scored each night because their production is tied to number of opportunities to score points which is directly tied to minutes on the floor. The amount of minutes a player is on the court in an NBA game is fairly predictable. When you build a cash game lineup you want to target fantasy players that consistent minutes on a game in and game out basis. The more time they are on the floor, the more opportunities there are for fantasy points. In fantasy basketball, you can score fantasy points both on offense with points, assists and rebounds, and on defense with blocks, steals and rebounds. With only 10 guys on a basketball court at a given time, the more time a player is on the court, the more opportunity for him to score a fantasy point of some sort. Winning money in Cash games is more about value than upside. If you focus again on the primary goal of a cash game fantasy lineup is having the highest floor possible, then you are picking guys that will on average score you enough points that night to beat the other half of the field. Targeting the cheap fantasy basketball sleeper picks will be a strategy that an opponent will have and his floor is lowered if the sleeper pick doesn’t pay off. If your high floored players play like usual, you will cash in more lineups against the players that simply build a lineup with no strategy at all. Playing in a tournament or GPP means a different strategy than the cash games strategy above. When you build your fantasy lineup, you are looking for players with the highest possible ceiling to win you the big money. Playing in GPPs means playing against not only thousands of players, but also you are playing against some of the top daily fantasy basketball players in the world. You put up a contest with millions of dollars in prizes and the best of the best will come out as will everyone else. While a 50/50 or head to head game pays out the top 50% of entries, GPPs typically pay out about 20% of the total entries if the contest fills. Because you are competing against so many players and the odds of winning are greatly reduced, you want to target NBA Fantasy players that have upside over players with a high fantasy floor. First is finding the sleeper picks that are low cost options to stick into a lineup that usually have a low fantasy floor but you think or believe will that night have a break out performance. Pairing sleepers with players that generally have high floors on most NBA nights can improve your odds of finishing in the top 20% of the field. It’s important to remember not to just take a few stars and fill your lineups with Sleeper Picks as you can still find players with a high average floor but due to matchups also have a high ceiling as well. The second fantasy basketball strategy that gets used for large tournaments is the Contrarian Play strategy. There are certain NBA players that will be a high ownership in a tournament. Whether it’s because the price is too low, or they are starting instead being a bench player or simply they have had a string of 2-3 great games and everyone wants to play the hot hand. Some top daily fantasy basketball players will often stay away from the popular pick and target players that have a low ownership percentage. The strategy behind this is to separate their teams from all the others that will have the high owned percentage player. If their lineups all bust because the players don’t perform, the contrarian lineup usually finishes higher in the money because their team produced. That doesn’t mean that you go way off the grid when making a contrarian play. Look to target a superstar player that because of a tough matchup against a defensive team, other fantasy players are staying away from. Superstars are stars for a reason and if their ownership is low and they buck the trend and dominate that night, you will again finish higher than the others. You may know your NBA fantasy basketball, but so do others that you are competing against. You can win at our affiliate partner sites FanDuel and DraftKings if you build smarter lineups and learn these types of strategies that the top players already use.